The San Jose Sharks have lost on the road less than any other NHL team, and they have not lost anywhere in more than two weeks. It's been nearly 2 1/2 years since the Chicago Blackhawks beat them. The surging Sharks kick off a three-game road swing on Friday, looking for their 11th straight win over the Blackhawks. San Jose enters this contest having won seven consecutive games, including five straight away from home to stretch its NHL-best road record to 22-8-3. Every other team in the league has at least 10 road losses. The Sharks (38-21-8) also have moved within three points of Dallas for the Pacific Division lead, and have played three fewer games than the Stars. San Jose might be able to overtake them on this road trip, which includes stops at Minnesota and Nashville after a visit to Chicago (33-28-6). The Blackhawks have not defeated the Sharks since a 6-3 win at Chicago on Oct. 7, 2005 - both teams' second game back from the season-long NHL lockout. Since then, San Jose has won 10 straight in the series, outscoring the Blackhawks by a combined 35-17. This season, however, all three meetings have been decided by one goal, including the Sharks' 3-2 shootout win in San Jose on Feb. 2. There also have been plenty of close games during the Sharks' current win streak, with none of the seven victories coming by more than two goals and two being decided after regulation. Wednesday's 3-2 overtime win over the Ottawa Senators was no exception, as San Jose needed Jonathan Cheechoo's equalizer with less than three minutes left in regulation and Patrick Marleau's goal - his second of the game - in the extra period. Cheechoo has a goal in six of the last eight games, while Marleau has three goals and three assists in the last five games since the trade deadline passed. San Jose's captain had been rumored to be involved in trade talks, and had just 29 points in the first 58 games after totaling 78 points in 77 games last season. "A world of weight has been taken off his shoulders," Sharks coach Ron Wilson said. "That's helped. It's always hard to play when you're worrying about being traded. That news that he wasn't energized him." The Blackhawks also have been playing high-energy hockey, having won three straight as they continue their push for a playoff spot. They have gone 10-3-1 in their last 14 games, moving into 11th place in the Western Conference. Chicago is coming off a 3-0 win over another streaking Pacific Division team, having ended the defending Stanley Cup champion Anaheim Ducks' six-game winning streak on Wednesday. 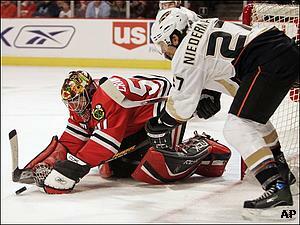 Anaheim also had won five in a row against the Blackhawks. For Chicago, Dustin Byfuglien and Cam Barker each had a goal and an assist while Corey Crawford made 19 saves to earn his first win and shutout in his second career start. Crawford played to give backup Patrick Lalime a break while starter Nikolai Khabibulin remains out with back spasms. "He played a heck of a game for us," Blackhawks coach Denis Savard said of Crawford. "He knew this game was coming up a couple of days ago. It was important for him to prepare so he could be relaxed. He looked relaxed to me." Patrick Lalime won the first two games of Chicago's current run, allowing three goals on 40 shots. He could be back in net on Friday, but Lalime has not beaten the Sharks since Oct. 18, 2003, losing six straight starts against them while posting a 4.70 goals-against average. San Jose forward Jeremy Roenick, who played his first eight seasons in Chicago from 1988-96, is day-to-day after missing the last two games with the flu.